It seems like comedian Chris Gethard is everywhere I look, showing up time and again on the old news feed. It’s probably because his sense of humor plays off the widespread anxiety that we all seem to have. 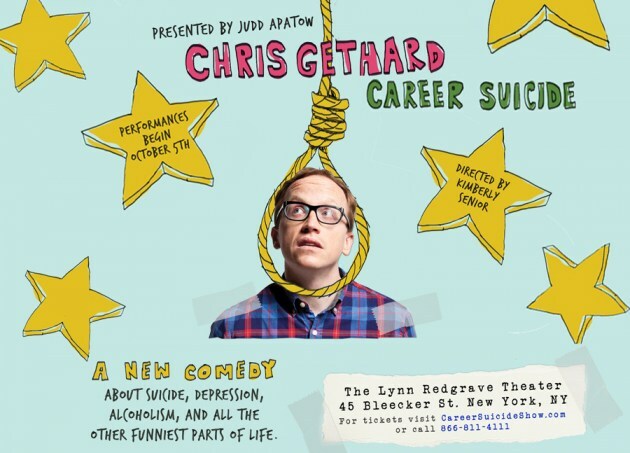 This week he’s premiering his off-Broadway Apatow-produced play, Career Suicide, which retells Gethard’s own real-life suicide attempt–as a comedy. Which tells you something about his sense of humor. Like so many of us, I didn’t know who Gethard was until a couple months ago when a friend recommended his podcast Beautiful Stories from Anonymous People, each episode of which is an hour-long phone call from one random and anonymous person. Sometimes the caller has something to get off his or her chest, but sometimes, more often than not, they just want to talk. These conversations have stripped away the things that we usually use to help discriminate between ourselves and strangers—our looks, our jobs, our ‘passions’. When the podcast starts, we hear a typically nervous “Hello…?” and the only thing we know about the caller is his or her voice. It’s a pretty fragile situation. The calls aren’t heavily filtered–whoever gets through gets through. It should come as no surprise–but often does–that so many of these callers do have “something more” going on. Don’t we all? Like this week’s call, “10,000 Pounds,” in which a London-based caller chit-chatted for a half-hour before revealing—after some gentle prompting—that her sister had stolen 10,000 pounds from their father, and that their entire family was struggling to come to grips with their resident delinquent. A similar example came from the nice Mormon father who felt he was cracking under the pressure of religion. Or the chatty Hollywood burnout who had been robbed by Nazis. All of that sounds thrilling–but if you haven’t listened to Beautiful/Anonymous before, you might be surprised to find that these calls are often—as far as podcasts go—really pretty boring. Even though it is true that, as Vanity Fair says, the callers are “baring their souls anonymously,” it seems a lot more interesting than it often is! What I’ve learned from Beautiful/Anonymous is that the human soul, maybe, isn’t this walloping force of nature–it actually seems like a quiet, often boring thing that just needs to be loved and listened to. Like an elderly grandma sitting in her chair talking to whoever will listen while people come and go at Easter dinner. The grandkids get up and play cops and robbers and come back an hour later and she’s still going. Even the parts of the conversations that do get really ‘dark’ or ‘juicy’ only last a few minutes, and the rest of the hour tends to consist of Morrissey fangirling and gossip about friends and family–one of the most entertaining episodes was when a caller spontaneously three-way called her mom, who had never heard of the podcast but was just thrilled to participate in her daughter’s hip guest-on-a-podcast experience. More than just a confessional, Beautiful/Anonymous is a chance for someone to talk and be heard. Which might not be your cup of tea, honestly, because it is unstructured and it is mundane. 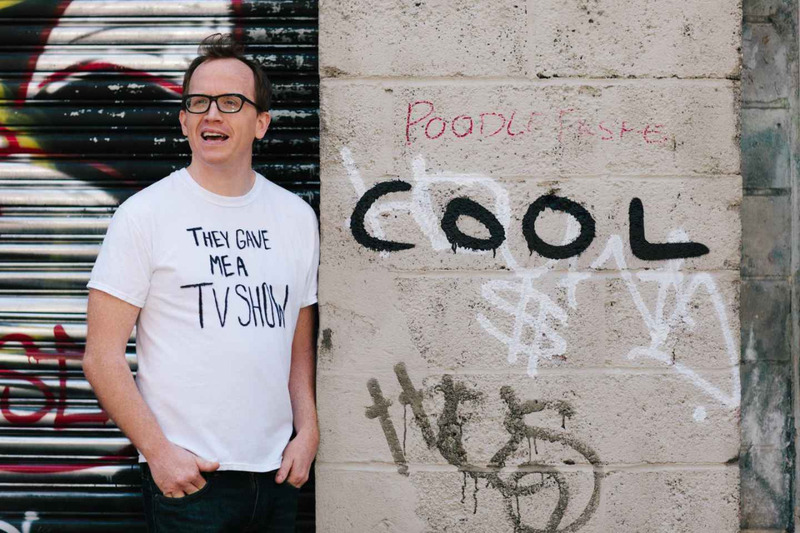 Gethard explains that with his comedy, “I have no desire to get on a soapbox or be preachy. I don’t think comedy needs to be ‘brave’ or ‘important.’” We see this attitude with Beautiful/Anonymous, too. Lost in a constant stream of other podcasts with engrossing content and front-loaded humor, Gethard’s meandering conversations seem to be floating in stagnant water, not asking to teach or be relevant. Each episode is slow, full of U-turns, and totally driven by the needs of whoever is calling on the other line. The first time I saw a shrink I was 22 years old, which was at the tail-end of about five or six very dangerous years of avoiding it. It’s by far the hugest regret in my life that I didn’t just own up to it and get help. I could have saved myself a lot of pain. Instead it was, “I need to be tough, I need to handle this on my own, medications are weak, I haven’t hit that rock bottom yet,” and man, I could have just lived a happier, more peaceful life if I got out of my own way and just went for it. I understand it because as a culture we have perpetuated this idea that you’ve in some way failed or given up when you see a shrink, but I think that’s a very unnecessary barrier of entry that has causes pain and suffering to go on far longer than it should. I’d guess that much of Gethard’s current momentum comes from his upfront abandoning of the “I need to be” mentality. So often we think that we need to have an interesting story or a relevant career or an interesting pair of shoes; Gethard tells us, No, you can just call and talk and star on an episode of a podcast, no resume required. He’s suggesting that whoever you are, you’re enough. In Vanity Fair he explained, “Regular people have a lot to say, and I don’t know if they always have a place to say it. I like to think my podcast serves as a platform for them to be heard, regardless of whether or not I agree with what they’re saying.” Fans of the cast often say that it’s a brilliant concept–to which Gethard invariably responds, “It’s sad that listening is an original idea.” But it is. We don’t like to listen. And we don’t need to be told to listen better–instead, what we need is someone to listen to us. What would you say if you could speak up anonymously to someone who might actually listen? In Christianity, this is one way to look at prayer. Open forum, any time–the best listening ears there ever were are yours. No need to write yourself into a fascinating plot. To Beautiful/Anonymous, I’m grateful for the reminder.